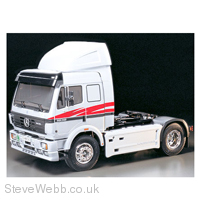 This Mercedes 1838 LS is a scale tractor truck with a realistic ladder frame and a 3-speed gearbox. The suspension is equipped with solid axles with leaf springs just like full-scale trucks. The 1838LS tractor truck combines a massive aerodynamic silhouette with a powerful 380 horsepower, 12,763cc V8 cylinder turbo diesel engine. Tamiya's R/C model of the 1838LS truck realistically captures the looks of the full size truck.